That little Hondas looking good ese. My new Kenda K272s arrived last week. (Second time I've dealt with motorcycletiresmaniac.com [actually Cedar Rapids Tire in Iowa], and was very pleased with them again.) I soaked the fork springs and collars in phosphoric acid for a couple of days, then painted them with flat black Rust-Oleum. Also bought new rubber gaiters. Woke up early this morning and spent a couple of hours in the garage before work. I got a lot done (unusual for me). Swapped out the front tire, put the forks back together, and reassembled the front end. Only afterwards did I give the wheel a spin and realize that the front rim is slightly bent. Well, crap. Unless it causes a huge handling problem, it's going to stay that way until at least after the Moto Giro on the 12th. The headlight bracket I bought through Ebay arrived missing the inner half of each side, and no way are they sized for 27mm forks, as per the description. I'm going to just make up something myself. Last edited by Tanshanomi; 08-31-2015 at 10:20 AM. Well, I was not able to ride the Honda 125 in the Giro today, but I was able to ride the bike for the first time today, even if it was only a couple of blocks with the headlight zip-tied in place. The missing parts for headlight bracket I ordered from China arrived, but of course still didn't fit the 27mm forks. Also, 6V turn signal bulbs to fit the aftermarket turn signals (the second set I bought) won't arrive for another couple of weeks...I had to order them from Slovakia (yes, really). There is still a lot to do: not only do I have to resolve the headlight and turn signal issues, but the petcock leaks fuel, the used speedometer I bought off Ebay doesn't work (bummer), the new exhaust I made is little too loud, and the chain is hitting the chain guard somewhere (you can hear it in the video). Of course, once all that's taken care of, it will still need a proper paint job at some point. But it starts and goes and stops quite nicely! WOOHOO! This was also my first chance to try out my new GoPro Chesty camera strap. Last edited by Tanshanomi; 08-02-2017 at 09:15 AM. YucA and kerosene like this. 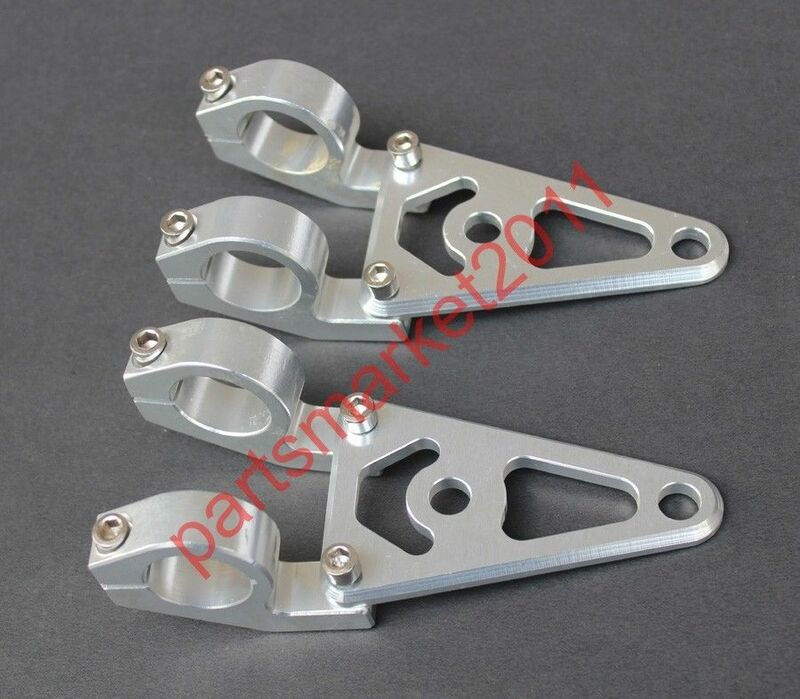 Broke down and ordered some proper headlight brackets, even though I swore just the other day that I would never order direct from China again. For $43, it really didn't make sense to spend time fabricating something similar. Awsome. Hey.......we should start a 1%er small enduro cool club. I like how yours is turning out. I was actually able to spend a couple of hours in the workshop this morning. The first time in, um, probably 2-1/2 months? One of the reasons I've been doing nothing for the last few months is that my enthusiasm for this "quickie" project pretty much drained away with each new discovery of unseen flaws and damage. Electrical troubleshooting was a major headache, but fortunately I was not in a good position to just give up. I spent hours upon hours last fall with a multimeter and a test light. I had breached insulation causing intermittent grounding, several bad bulbs that were also intermittent, and the big culprit, bad switchgear. I bought a replacement left-hand switch housing around Halloween, which indeed solved most of my problems. I also had to buy a new clutch lever and perch, since the stock one was integrated into the switch housing; this is actually a good thing, since the old one was pretty buggered up. Anyways, work and family life has finally slowed down, I got my motivation back, and they both got installed this morning, along with new grips. I did some testing and discovered that all the wire colors are the same as stock, so I'll be wiring the switch in today or tomorrow. This bike had been crashed much harder than I realized, and when I remounted the headlight I learned that the steering stop on the steering head tube is badly tweaked. Because if this, the headlight bracket hits the tank when turned all the way to the right. Not a hugely difficult fix, but it's yet another thing I need to address. Fortunately, I am back into it and trying to look for the light at the end of the tunnel. I'd really like to get this on the road so I can get back to the Bul bitsa project, which has been at full stop for well over a year. Just as an update, I have finally sorted out all the major issues with this bike. The last issue was a bad float needle and seat (as you can see from the drips of fuel on the ground in the photo). Replaced that this morning before work, and then rode the bike to the local garage for a state safety inspection. Successfully passed, so I can finally get the bike plated. After that, I took the long way back home to fill up at a gas station that sells ethanol-free fuel, and the damn thing seemed to run like it should — clutch and brakes worked properly, it handled predictably, engine idled nicely and wound out well enough. There is definitely more to do, of course. The temporary stand-in speedometer is from a Honda NX50 Express SR, and the spray-bomb paint job is not fuel safe, so that's already lifting off in places, but there's nothing keeping me from riding it back and forth to work this summer. Last edited by Tanshanomi; 04-13-2016 at 08:53 AM. Last Saturday, I rode the CL 19 miles to the KC Vintage Japanese Motorcycle Club's Spring Show and back. The Express SR speedo (my FOURTH!) shot craps about 5 minutes into the ride and screeched noticably the rest of the trip, even over the louder-than-stock exhaust. The gas cap leaks, dribbling fuel all over the tank. To add to it, the quickie spray-bomb engine paint on the tank isn't fuel-safe, and is lifting all over. Making left-hand turns from stoplights, the bike would sputter for several seconds. I'm guessing it's the float level. The idle varies dramatically between cold and warm. Couldn't find one setting for the idle adjustment screw that wasn't either coughing and dying or racing way too high at some point. I assume some additional carb work is in order. The 6-volt turn signals are pathetically dim. My wife was riding right behind me and in bright sunlight she couldn't tell when they were on, even when she was staring right at them. The bike cruises quite nicely at 45-50 MPH and handled just fine, though the brakes are a whole lot weaker than I remember them being back in high school! My cobbled-up exhaust held up fine and no parts fell off, so I guess that's something. I have to say, I am losing enthusiasm for this bike. I'm not sure how much I'll actually want to ride it once I get it all sorted, which dampens my motivation somewhat. I've toyed with putting an ad on CL and seeing what I can get for it, but I go back and forth on that idea. You can only sell something once, then it's gone. Last edited by Tanshanomi; 05-26-2016 at 11:17 AM.